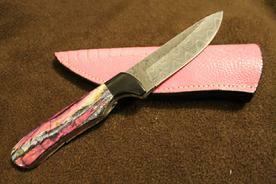 Vertical Sheath Knife with a pink mammoth tooth handle. The bolster is made from buffalo horn. The blade is made of Damascus Steel, and the sheath is made of Ostrich skin. Keith is a master craftsman who takes great pride in his work. Born and raised in South Louisiana, he worked as a gunsmith and later owned Custom Gun Works for over 20 years. In 2003, he sold the business and headed to the Hill Country. During his time at the gun shop, Keith met some experienced knife makers who gave him some pointers in knife making. After moving to the Hill Country he was able to work on, and perfect, his skills in knife making. He was urged to get into the business of offering his knives for sale. Keith does his best to satisfy any and all who order from him. Keith's custom knives are handcrafted in the heart of the Texas Hill Country. He makes all types of knives including hunting knives, fishing knives, kitchen cutlery, folders, and just about any custom knife you can dream up. Each knife is handcrafted using a variety of steel and handle materials. All blades are custom profiled and ground, and hand fitted to a sheath, making them a true "one of a kind" knife. Keith is always willing to learn and is very appreciative to others in the business who enjoy helping one another by sharing trade secrets. Keith would also like to thank everyone, past, present and future, who have purchased a custom knife and hopes they enjoy it, as they pass it down generations. 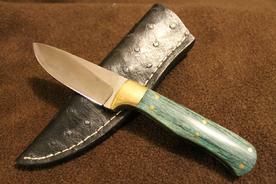 Vertical Sheath Knife with a turquise giraffe bone handle. The blade is made of 154cm steel, and the sheath is made of Ostrich skin. Hill Country Texas Custom Knives is not responsible for injury or damage caused by negligence or improper handling of our knives.